Over the course of two days this past month the Leverhulme doctoral scholars in climate justice along with guests and external speakers met for the annual Scholars’ Conference: “Climate Change: Dialogue Between Disciplines.” Here, we summarise the speakers’ contributions to the conference and tease out a few threads running through the many talks. After a warm welcome from the director of the Leverhulme Programme in Climate Justice, Professor Catriona McKinnon, presentations began with the first keynote speech, given by Professor Neil Adger (University of Exeter). This encouraged the audience to think about the different ways climate justice is understood and acknowledged, arguing that citizens’ perceptions of fairness directly affect policy success. The implication of this insight being that policies must be attentive to fairness, perceptions of fairness more precisely, to achieve effective community realisation. Attention then turned to the Leverhulme Scholars’ panels. 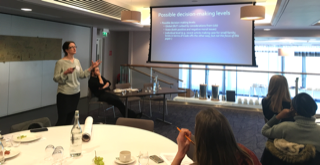 Jessica Omukuti (Agriculture, Policy & Development) explored how equity is represented in policy processes, arguing that a policy influence framework can be used to assess how different actors can have an impact on equity in policy processes. 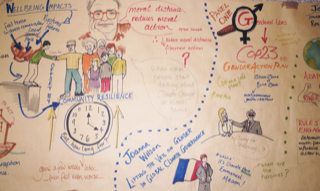 Jessica’s invited speaker, Joanna Wilson (University of Manchester), then spoke about the relationship between climate justice and gender and her experience of COP23 in Bonn, arguing that it was an acutely gendered arena. Jamie Draper (Politics) and Pierre André (Université Paris-Sorbonne) formed the second panel. Jamie presented on matters of justice in climate migration. He argued that relatively minimal global justice commitments can yield strong duties towards climate migrants and provided a sketch of how the provision of asylum might function as a remedial responsibility owed to those displaced in the context of climate change. Pierre then presented on compensatory justice, arguing that although compensation seems appropriate when applied to the case of small island states there would be serious shortcomings in its implementation. In response to this problem, Pierre’s talk noted a role for encouraging a form of radical hope. To wrap up day one, the newest Leverhulme Climate Justice Scholars presented introductions to their research. Livia Luzzatto (Politics) started off by asking what we owe to future generations and how this intersects with climate change. What rights do future people have? What duties do these rights give rise to? What does meeting these duties mean for climate policy? Livia’s presentation focused on the special interests and capacities of persons which ground rights for persons present and future. Up next was Africa Bauza Garcia-Aracicollar (Agriculture, Policy and Development). 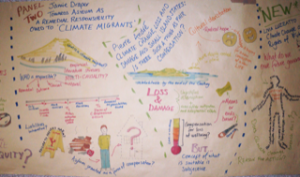 Africa’s presentation centred on the consequences of framing climate change induced migration as a question of “moving or drowning.” She argued against this approach as it can stir negative emotions which forecloses the future of islanders making them ‘powerless’ victims. She suggested that we encourage a more open conception of the future which places humanity at the centre by additionally theorizing responses to climate change in terms of hope. Adam Pearce (Politics), then presented some considerations when thinking about a role for criminalisation in mitigating climate change. His starting point was to establish good reasons for thinking about stricter enforcement of limits to greenhouse gas emissions. However, the talk went on to note the difficulties associated with criminalising contributions to climate change arising from apportioning blame to specific actors and fitting these sorts of act into existing moral theories of criminalisation. Finally, Zainab Aliyu (Geography) presented on “Climate Justice Movements in sub-Saharan Africa.” Her presentation pointed out the irony that sub-Saharan Africa is least represented in global climate debates despite being among the most at risk to the detrimental impacts of climate change. Zainab’s presentation analysed how sub-Saharan Africa can mobilise a powerful and effective climate justice movement to raise their profile and influence at international climate negotiations. This presentation, and the day, ended by highlighting that the first step to finding a practical solution to climate change is to connect with and inspire the population to climate action. Day two of the conference saw a continuation of the interdisciplinary dialogue with speakers from both the natural and the social sciences. This dialogue is comprised, first, by the recognition that in order to secure climate justice we must be sure to use, interpret, and communicate climate science carefully and effectively. Second, we must view climate change, and possible responses to it, within the current context of global poverty, environmental degradation and global security threats because both the causes and effects of climate change are deeply embedded within society. The second day’s keynote speakers can be thought of as exemplars for furthering the two prongs of this dialogue respectively. The day began with a keynote speech by Professor Mark Maslin (University College London). His presentation emphasised the need to start with a sound climate science basis in order to devise just and effective adaptation strategies. 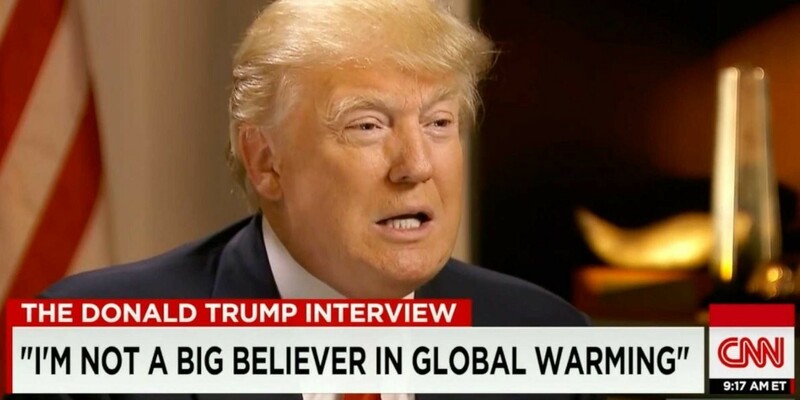 Most strikingly, he defended a factual claim that ‘maladaptation kills, not climate change.’ This was not to say that there is nothing wrong with anthropogenic climate change; rather, whatever wrong occurs due to climate change is mediated through how human societies deal with it. The day’s second keynote speaker, Dr Elizabeth Cripps (University of Edinburgh), assessed the compatibility of global, intergenerational, and climate justice with population growth. She argued that while trade-offs might be needed to jointly satisfy climate justice and procreative liberty, present generations must draw red lines to delineate moral no-go areas. One such no-go area must be securing basic justice – i.e. the protection of basic rights – for all present and future. Later that afternoon, second-year Leverhulme doctoral scholars Bennet Francis (Philosophy) and Lydia Messling (Politics), as well as visiting speakers Laura Garcia-Portela (University of Graz), Erin Nash (Durham) and Jo Hamilton (Reading) presented some of their thought provoking work in two panel discussions. Bennett and Laura pointed to the difficulties of ascribing individual responsibilities for climate change. Bennet argued that attributing emission reduction duties to individuals as a matter of justice is i) disproportionate, and ii) unviable. Laura’s presentation assessed the possibility of attributing individual duties of compensation for climate losses and damages; she, too, suggested that such duties cannot be discharged, since individual wrongdoing is embedded in a wider collective injustice. The day closed with a panel led by Lydia, who presented a framework along which to map the possible degrees of climate science communication – from silence to active policy advocacy. She argued that scientists’ inaction in the form of silence can be interpreted as a form of advocacy which problematises attempts to remain policy neutral. Erin, too, looked at how expert testimony is perceived by the public; she argued that in order to trust an expert’s opinion, the public must be able to access higher-order evidence about her – i.e. proof of their expertise in the field. When this evidence is veiled by the media and becomes difficult to access, public trust is reduced. In the final presentation of the day Jo took a closer look at public responses to climate change, mapped the range of emotions used to express them, and discussed how these can be harnessed to foster climate action. She suggested that allowing, expressing, and particularly sharing emotional responses in facilitative group settings can enable and sustain engagement with environmentalism. As we hope is clear from our summary, the conference was insightful on multiple fronts. On reflection, at least three thematic linkages arise. 1) How morality sets constraints for policy beyond practical feasibility. This was particularly apparent in Dr Cripps’ talk which challenged empirical interest in population control solutions to climate change with a forceful defence of basic rights and their role in limiting this possibility. Yet, analysis of gender dynamics in climate negotiations; requirements to facilitate higher-order evidence; the role of cathartic emotional engagement; and facilitating equity in the voices of the vulnerable were all topics which make similar demands of climate policy. 2) How evidence shapes the moral scheme of climate justice decisions. 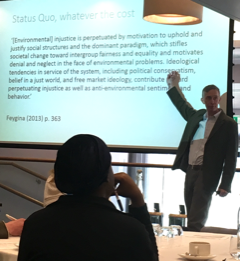 Professor Maslin’s talk epitomised this form of interdisciplinary communication when arguing that changes in climate are not in themselves unusual or necessarily bad, but how societies cause and respond to these changes may be. This reminder that climate change is not wrong simpliciter is a reminder to climate justice theorists that their theories ought to be nuanced. Talks on the moral responsibility/blame of individuals; the remedial rights of climate migrants; and the position of hope in climate justice discourse were all excellent examples of how to ground climate justice claims in the facts of the matter. 3) How perceptions percolate into the success or failure of climate justice initiatives. Professor Adger’s talk emphasised the positive role a sense of fairness has for policy goals and many talks, at least implicitly, had this kind of consideration in mind. For instance, protecting the rights of future people engenders a sense of intergenerational fairness and assessing the prospects for stricter enforcement takes seriously the aim of preserving fairness in attempting to avoid free-riding. While understanding the wider perceptions of expert testimony, even when experts stay silent, is also critical. 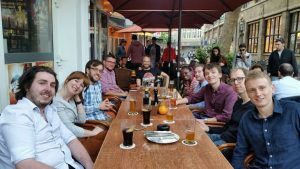 Finally, it behoves us (the newest doctoral scholars) to thank especially the speakers and visitors for their sharp commentaries on our germinal projects. Any nerves were quickly dispelled by the encouragement of all and our projects are already improved immeasurably because of insightful questioning. 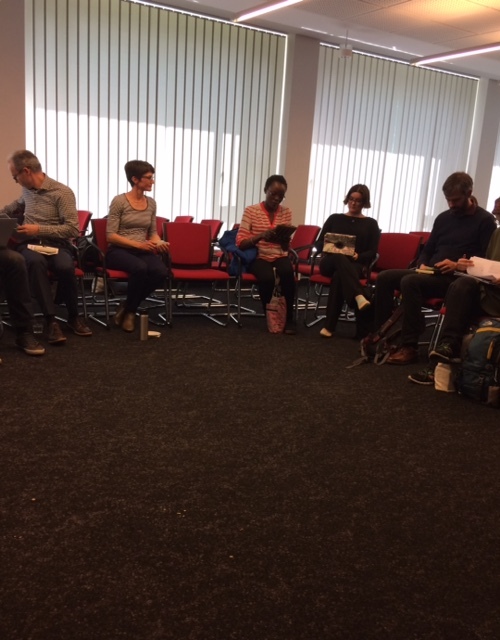 On the 14th November, the Climate Justice programme gathered academics to discuss and share learnings about climate change communication. Climate science is not the easiest thing to talk about in the first place. The science is complex, full of uncertainties, and it’s practically impossible to fully get your head around all of the predicted effects and what they would mean for our earth. But just filling in the ‘knowledge gap’ for decision makers by presenting this data has not resulted in any real tangible change – not really. Not, at least, in ways that we need if we are to have any hope of halting warming at just a mere two degrees. So how are scientists to communicate climate change to policy makers and the lay public? Should communications be framing policy options in terms of climate justice? Mix that with a turbulent political context, where climate change has become an even more polarising issue, and we find that talking climate is actually considered talking politics. Any effort to talk about climate change therefore inextricably engages in people’s world views and their conception of identity. Katharine Hayhoe, a climate scientist based at Texas Tech University, is one of the most recognisable voices in the states that is talking about climate change. And, in what may come as a surprise to some, she is also an evangelical Christian that credits her faith as being the motivator for her engaging in actions to prevent climate change. Studies show that listening to her talk about climate change and faith has successfully resulted in convincing doubting evangelical Christians that climate change is real, and something that need action. As the opening keynote speaker, Katharine gave us a whistle stop tour through the ways in which different audiences perceive climate change, and gave examples of how her own interactions with different people have influenced the way in which she approaches talking climate. Katharine explained that by bonding, connecting, explaining and inspiring, conversations about climate change, and what needs to be done to address it, can happen. Bonding and appreciating what things you have in common with someone, and what things you both value, helps to establish a common understanding. In doing so, you can begin to connect in a meaningful way: given our shared values, why might we care about climate change and its effects? For example, Christians may care about climate change given their belief that they are to be caretakers of God’s creation. Instead of being an intangible distant scientific phenomenon, climate change then becomes something that our values can interact with. By understanding how our values might make sense of climate change, we can begin to identify ways to respond to it, explaining why we might care. Explaining climate change and action on it in a way that is in line with our beliefs allows people to care about climate change and retain their identity – not everyone has to wear crocs and hug trees and be a member of Greenpeace. But this alone won’t be enough. In order to truly ignite a sustained engagement in climate change, and encourage action, the conversation needs to inspire further conversation with others about solutions. By communities uniting around shared values, engagement in climate change can become less about talking politics and more ab out talking solutions. 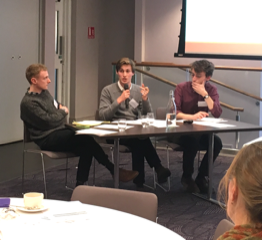 We next heard from Max Boykoff (University of Colorado), Anabela Carvalho (University of Minho) and Mike Goodman (University of Reading) talking on the subject of culture and climate change. They talked about how different people interact with climate change. Max gave examples of how one project, ‘Inside the Greenhouse’, explores climate change through theatre, film, fine art, performance art, television, and even comedy nights. As climate change is predominantly framed in scientific terms, branching into other mediums of communication allows for a new way of engaging in climate change. Media portrayals of climate change, as Anabela explained, tend to vary depending on their politics, but also the type of media that they are. Traditional news outlets tend to focus on endorsing the views of the political elite, whereas newer sources (such as Buzzfeed) tend to provide a stronger counter-narrative. Mike then talked about how celebrities act as emotional witnesses for us to climate change catastrophes as they film documentaries. By leveraging the connection fans feel with celebrities, showing celebrity concern for climate can provide a way for new audiences to engage with the issue. 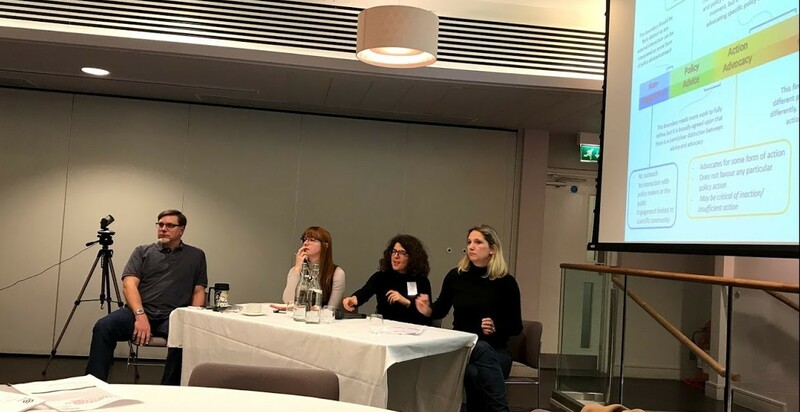 The next panel had Alyssa Gilbert (Imperial College London, Grantham Institute) Emily Shuckburgh (University of Cambridge) and Lydia Messling (University of Reading), and discussed how science plays a role in communication. Alyssa talked about the need for scientists to be speaking, and maybe even in more emotive terms, about how they see climate change. Scientists remain as trusted messengers by the public, but this too can differ depending on the audience. Emily also talked about trust, and how the attributes of independence and integrity are essential for maintaining public trust in science. As such, scientists have a duty to go further and seek to make sure that their information is sufficiently well understood by the audience, and that things are not misconstrued. In this sense, everybody is different when it comes to engaging in advocacy. Lydia then presented her research into how scientists should (or should not) engage in policy advocacy and proposed a spectrum of different advocacy and non-advocacy a scientist can engage in. There appears to be a difference between engaging in specific policy advocacy, and advocacy that just asks for some form of action to be taken. The final keynote of the day was given by Susan Moser, who asked if we can find a way to frame the depth of the necessary change needed to tackle climate change. Susanne said that the arts help us to explore what the future might look like. Therefore these communications about climate change need to be in touch with people’s deep desires to want to be good, foster a public love of community and have a way to work through different emotions toward climate change. Tapping into emotions can help us to put our energy into motion: e-motion, if you will. One powerful emotion in helping to sustain engagement in actions is hope. And the hope needed to overcome climate change is like no other in human history. As Katharine Hayhoe said on responding to the challenge that climate change presents: “the fear is in my head; the hope is in my heart” and it is that hope that spurs action. Communicating climate change in troubled times therefore needs to make use of all of these different ways of communicating, and allow different people, including scientists, to engage in these different methods to form new dialogues with new audiences. Climate change is not just a topic of scientific interest. It’s one that engages in people’s values, including our ideas of what justice looks like. The culture of climate change in communities, and the emotional reactions to climate change are just as important (if not more so) than our scientific understanding of it. On 11th November, the University of Reading hosted an ESRC Festival of Social Science event ‘Climate Justice: can fairness create a green future?’. 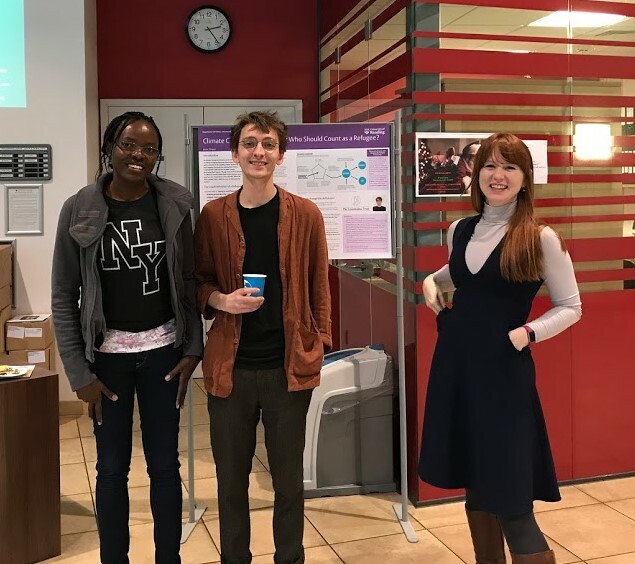 The broader aims of the festival were to raise awareness of the social science research currently being conducted in the UK, and the Reading event showcased the PhD projects of the Leverhulme Climate Justice scholars studying at the University. The sold-out event was open to the public, and it was encouraging that so many were interested enough in climate change to give up their Saturday afternoon to come and talk about it. The challenge for the Scholars was to communicate their research in an engaging and informative way to this primarily non-academic audience. To this end, each prepared a poster shedding light on at least one aspect of their project and these were dotted around the foyer of the Minghella Studios, through which the attendees could meander freely. The audience were encouraged to put their questions to the scholars and to feed back on the ideas presented. These enquiries – certainly from where I stood beside my poster – were astute and challenging, and an audience keen to engage ensured that no Scholar had to resort to competitive sales patter to attract passers-by. Every twenty minutes or so, the chatting was put on hold so that a selection of scholars could deliver a short synopsis of their research. These talks, delivered dramatically from a staircase overlooking the foyer, had a twist: the presenters’ vocabularies were limited to the thousand most common words in the English language. In keeping with the spirit of the day, the idea here was to challenge the scholars to communicate their research free from the jargon that quickly swamps academic debates. And it was a challenge: neither ‘climate’ nor ‘fairness’ were permitted on this restriction, for example, let alone the more niche ‘stratospheric aerosol injection’ that is the subject of one particular project. Given these constraints, the scholars did a good job, and the light-hearted tone of these talks was a compliment to the more focused discussions that took place in between. ‘The world is getting hotter’, we were told, because ‘we have been burning lots of dead animal bits’, and ‘this is very bad’. The climax of the event was a screening of the film Greedy Lying Bastards and a Q&A with Professor Catriona McKinnon, director of the Leverhulme Programme. Craig Rosebraugh’s unsettling documentary is an attempt to expose the role of corporate sponsored climate denial, one notable obstacle to climate justice, in shaping public opinion and blocking effective policy. It made stark not only the perniciousness of these corporate interventions into debates about climate science but also, by focusing partly on the stories of victims of climate change-related extreme weather events, the urgency of the issue that confronts us. In rounding off the event, Professor McKinnon brought together the various strands of climate justice research that had been discussed throughout the afternoon and indicated where were new lines of study might develop in the coming years. 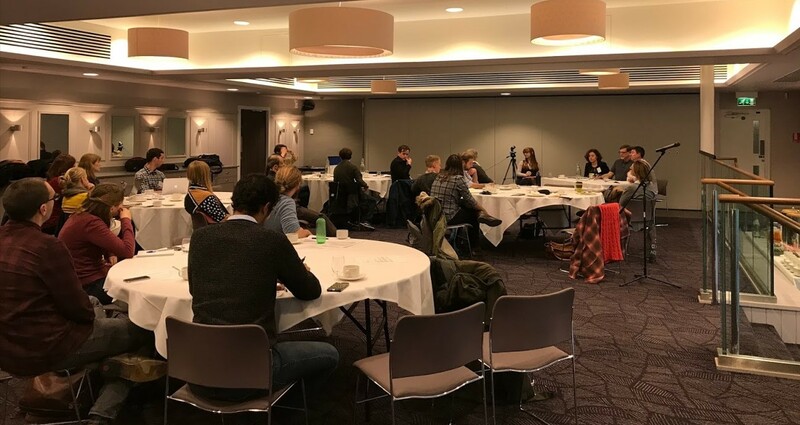 Overall the event was effective in balancing a pragmatic appreciation of the extensive barriers to achieving climate justice with an optimism about people’s capacity and genuine willingness to take concerns about fairness seriously. I also thought (and hope!) that the discussions were informative without being overly dry or abstract. These balances are not easily struck in climate justice events involving academics, and a lot of credit has to go to the shrewd planning of the organisers and to a public audience whose impressive knowledge about climate change constantly pressed the scholars to connect their research to contemporary political events. 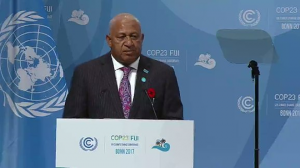 At 11am local time in Bonn, Germany, on Monday 6th November, the prime minister of Fiji, Frank Bainimarama officially declared COP23 – the first “island COP” of the UNFCCC – open, to kick-start the next wave of negotiations on how to tackle climate change. It was a rousing call to action – a drive to build a coalition of governments and across all sectors of society, to “put everyone first by locking arms and moving forward together”. The science on climate change, said the new COP president, is now clear: climate change poses a multitude of dangers, from floods to droughts, hurricanes to threats to human health and food security, particularly for the most vulnerable peoples of the world. As prime minister of Fiji, this suffering is, of course, something Mr Bainimarama has seen first-hand, and is anxious to protect his people from. In the wake of the recent revelation that 2016 saw record carbon emissions, the COP president urged his counterparts to advance their ambitions and to meet their Paris Agreement commitments in full – in particular, to commit to the most ambitious target of 1.5°C warming relative to pre-industrial levels. After all, Mr Bainimarama reminded the conference centre, “We are all in the same canoe”. 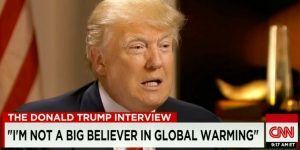 What followed the COP president were similarly passionate responses to the dangers of climate change. Each of the executive secretary of the UNFCCC, the secretary general of the WMO, and the chair of the IPCC cited the fact that 2017 is likely to be the warmest year on record and stressed the urgency of the window for action with which the world is now presented. They were joined in their calls for implementation of action by Barbara Hendricks, the German Federal Minister for the Environment, Nature Conservation and Nuclear Safety, who urged parties to persevere in moving away from fossil fuels and to address the “scientifically proven” and “existential threat” that is climate change. Every dollar spent, said Ms Hendricks, pays for better health, cleaner air, and more economic opportunities – a world in which our children and grandchildren can thrive. A pity, then, that the following items on the COP agenda lacked the same degree of harmony. The president had got only as far as presenting item 2(c), the adoption of the agenda itself, before cracks began to appear in the international community. 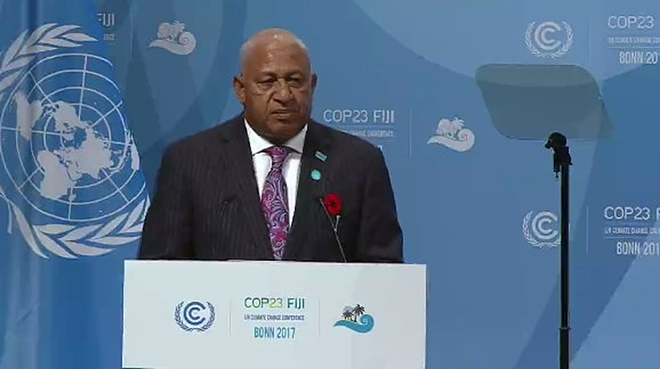 COP President Bainimarama announced that two items had been submitted by parties – the Democratic Republic of Congo and Iran respectively – which, in the president’s pre-COP closed door meetings with blocs and parties, had not garnered a consensus view, would not be considered for inclusion in the agenda, and that instead they would be investigated by the president of COP22 with a report to be written by Saturday. 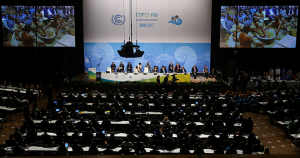 This prompted retorts from both parties, who asserted that their submissions had been deposited months before, and concerned increasing ambition levels for the COP negotiations, in particular for the pre-2020 period before the Paris Agreement comes into effect. Four other parties – India, Switzerland, Costa Rica, and China – urged the president at various points to reconsider, given the importance of starting action as soon as possible, and noted that no other parties had openly explained why a consensus was not achieved before the COP. Nevertheless, the appeals fell on deaf ears, and Mr Bainimarama repeated that the items would be addressed on Saturday. It was evident that, as the Indian delegate clarified, to ignore these requests was a serious issue of trust for developing countries at the COP. The remaining COP agenda items – the election of other COP officers, the admittance of observer organisations, and the organisation of work for the subsidiary bodies – as well as the CMP and CMA meetings, passed without objection, although this was to prove the calm before the storm. The last event of the morning session, which overran by more than an hour, much to the irritation of the Tuvalu delegation, was the joint plenary between the COP, CMP, and CMA committees, in which blocs of countries set out their initial negotiating positions. What little patience was left by this point began to fray as every speaker bar one easily overran the allotted time of three minutes – indeed, Ecuador, on behalf of the G77 & China bloc, even warned in advance that their speech would exceed the time limits. It became apparent early on that there was a clear divide in the room – developing country blocs, such as the G77 & China, AOSIS, the LDCs, the LMDCs, the African Group, AILAC, BASIC, and ALBA, all reiterating their frustration at the problems with the provision of finance, technology transfer, and capacity building measures to the developing world. A particular source of irritation was the “conditionality” which, it was argued, developed countries had attached to access to finance. 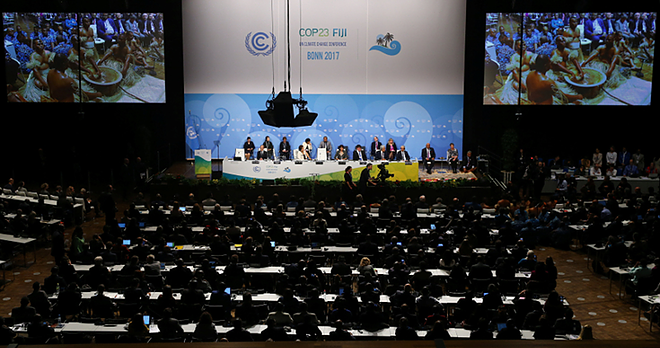 In the words of the Brazilian delegate, speaking on behalf of the BASIC group, this was “tantamount to a renegotiation of the Paris Agreement and a departure from the spirit of the UNFCCC.” Loss and damage was equally contentious, and a permanent place for the Warsaw Mechanism within the Paris Agreement was called for repeatedly. In response, the developed world seemed to have little to say besides generic platitudes. The EU recognised the increased severity of extreme weather and the need to help the world’s most vulnerable communities, and called for the Paris pledges to be scaled up and for draft decisions on all Paris work programme items to be completed next year. The Environmental Integrity Group committed itself to the Paris process, and called for ambitious implementation guidelines. The Umbrella Group was “committed to playing our part” and shared the COP presidency’s desire for a successful high level event. The theme they all shared, however, was a stated desire for enhanced transparency in determining national action plans on climate change, something which is likely to place them at loggerheads with the developing world, especially given their perceived standstill on all things finance-related. The US had even less to say – its delegate spoke for a mere 30 seconds, stating no more than that the Trump administration’s position is unchanged, but that the delegation will continue to participate over the next two weeks. The moment of greatest drama in the morning session came when it was Saudi Arabia’s turn to speak, on behalf of the Arab League. The Saudi delegate voiced his displeasure at the plenary rule of presenting statements in English only – perhaps with one eye on the clock (!) – and refused to speak in any language other than Arabic, citing parties’ “legitimate right to speak in their mother languages”. He “resented such disrespect”, and even went as far as declaring that “it seems like statements by some groups are not important”, deploring the fact that delegates had been asked to work through their lunches – although, as he also noted, by the time of his speech, the conference room was all but empty. “Absolutely not acceptable” was his final verdict, triggering an apology from the presidency. Danny Waite is on the COP-Climate Action Studio this week. With the way things stand at the moment, it is now clear that vulnerable groups in developing countries will have to wait a little bit longer to receive the climate justice they deserve through adaptation (see the optimism in the estimation of waiting times?). The good news last week was that the Green Climate Fund (GCF) approved a total of $392 million for climate action in developing countries. Why is this good news? Well, first, because even though there is still a significant adaptation deficit as reported by a 2016 UNEP assessment, the GCF allocation can start off the adaptation processes while the world continues to explore new ways of raising climate finance. Secondly, we see a slow shift from the ‘usual suspects’ recipients of adaptation funding to inclusion of other states. Lastly, we acknowledge an increasing focus on adaptation actions in these developing countries, for example, several of these projects involve water management which is critical for adaptation in areas that are experiencing rainfall variability and water scarcity. However, we don’t know the extent to which these projects will address integration of adaptation into development planning processes. Investing in capacities and institutions for adaptation policy planning, as highlighted in the 13th Sustainable Development Goal on Climate Action contributes towards sustainable development. 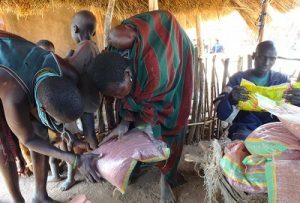 Policies that have been appropriately developed and implemented enable targeting of adaptation action to the most vulnerable. The fact that insufficient funding might have been committed to policy and institutional development fuels fears that vulnerable communities will have to wait longer to receive climate justice through adaptation. While many will agree that developing countries have made considerable progress in adaptation planning at both national and sub-national level, planning is still in its infancy and faces financial and capacity constraints. For example, most developing countries have already developed their National Adaptation Plans of Action (NAPAs), but implementation still depends on availability of funding. Some states are yet to implement the NAPAs. More adaptation policies have been developed post-NAPAs. After development, most of these sit and wait for external funding for implementation. Uganda presents a good example. Uganda’s NAPA was only implemented after support from DANIDA. Lessons learned from the NAPAs helped inform the National Climate Change Policy (NCCP) and its costed implementation Strategy. The NCCP has a deliberate focus on building institutional capacities at the national and sub-national level to address climate change, which is expected to translate into substantial benefits for the socially and economically marginalized in Uganda for improved adaptive capacity. The Government of Uganda insists that actual implementation of this policy will be dependent on availability of financial support. Uganda’s Ministry of Agriculture, with backing from the Food and Agriculture Organisation (FAO) has taken a bold step to implement the NCCP by developing an Agriculture sector National Adaptation Plan (NAP-Ag). The NAP-Ag will address vulnerabilities in the agricultural sector, which is very essential for communities which rely on agricultural production as their main livelihood activity. As this draft policy goes through parliamentary approval over the next few months, the big question is – How long will it take for the policy to be fully implemented? Conversations with policy actors in Uganda reveal that the government does not have funding to implement the NAP-Ag. So, the answer is–probably a few more years. Until then, agrarian communities will remain vulnerable to climate risks, and will continue relying on isolated local scale interventions by government and non-government actors that can only build short-term capacities to adapt to climate change. * This piece was inspired by a scoping field visit for research recently made to Uganda as part of the Climate Justice Doctoral program. The visit allowed me to partially understand Uganda’s national adaptation planning processes and the progress made with the NCCP and the NAP-Ag. On the 7th of September, political scientists and theorists descended upon Oslo for the General Conference of the European Consortium for Political Research. Amongst the many sections exploring myriad topics was one section titled “The Ethics and Politics of Climate Change – Theoretical and Empirical Investigations”. Over the course of three days, this was the locus of diverse discussions on different aspects of climate change politics, including panels on justice in adaptation to climate change, local variation in adaptation, the role of the notion of ‘loss and damage’, and mitigation options after the Paris agreements in 2015. My own presentation was in the section on justice in adaptation to climate change, and focused on the role of the provision of asylum or refuge to those displaced by climate change as an adaptive response. I argued that, in a certain subset of cases of climate-induced displacement, something like asylum or refuge can be an appropriate (if incomplete) remedy for the harms victims face. Further, I sought to demonstrate that an account of how the burdens or costs of such a remedy can be apportioned according to the responsibility the different contributions of different actors to the impacts of climate change. As John O’Neill’s excellent paper, “Dimensions of Climate Disadvantage”, showed, however, displacement is only one of a number of ways in which people can disadvantaged by the impacts of climate change. The key point from this paper was that the ways in which disadvantages from climate change impacts are felt are mediated through social factors, such as particular vulnerabilities to climate impacts, and the extent that particular communities are able to be resilient to the impacts of climate change. Whilst political theorists and philosophers often speak abstractly about burdens and benefits and their proper distribution, this paper was a clear reminder that our policy responses must be sensitive to the social scientific realities concerning how the impacts of climate change are felt. Another paper on this panel, “What Should Change and What Should Stay the Same?”, by Fergus Green, also sought to highlight under-appreciated aspects of adaptation. Fergus distinguished adaptation to the impacts of climate change from “adaptation” to the impacts of measures which seek to mitigate the impacts of climate change. Highlighting this kind of “adaptation” gives us useful conceptual tools to engage with growing topics in climate policy debates, such as the ‘winners and losers’ of economic diversification, the impacts of ‘response measures’, and the stranding of fossil fuel assets. Some of these issues were themselves raised in other panels, such as in Eike Duvel’s paper on stranded assets in the ‘loss and damage’ panel. The fact that topics such as these were discussed in both the sections on ‘adaptation’ and ‘loss and damage’ led to a series of discussions about the conceptual distinction between the two ideas. It became clear that it is easy to use these terms differently, and that clear stipulation of their content is required. In my own case, for example, whilst migration might be understood as an adaptive response to the impacts of climate change, the loss of a home and the subsequent provision of new lodgings elsewhere might reasonably be taken to be a matter of compensation for loss and damage brought about by the impacts of climate change. It should be clear that this is not merely an excessively academic point about conceptual clarity, but has direct implications for climate policy. Policy proposals and mechanisms which concern adaptation and loss and damage draw from different funding schemes, are subject to different requirements, and so on. So, even if the distinction can be messy, it is important to map the borders of these different concepts. Though an agreement concerning the interpretation of Article 8 of the Paris Agreement, which concerns loss and damage, specifically maintains that loss and damage “does not involve or provide a basis for any liability or compensation”, much of the discussion did also focus on the possible role of compensatory justice in tackling climate change. Even if it is not framed in this way in policy discourse because of the political unpalatability of the term ‘compensation’ in international negotiations, proposals which seem to involve the idea of compensation has been set out. In the loss and damage panel, the idea of compensation was explored from a number of perspectives; Laura Garica-Portela interrogated the notion of ‘making victims as subjectively well-off as they were’, which is often understood to be at the heart of compensatory justice, and Pierre André considered whether the distinctive cultural losses faced by those displaced from small-island states means that there can be no such thing as truly ‘fair’ compensation. The final panel, on mitigation after Paris, focused on the permissibility of, and issues raised by, different mitigation techniques. Ethical concerns surrounding negative emissions technologies (NETs) such as solar radiation management were raised, and Dominic Lenzi’s excellent paper sought to highlight that the possible implications of deployment of geoengineering technologies vary widely depending on the projected scenarios in which they are employed. The usage of market-based mechanisms such as carbon pricing was also debated, especially in Alexandre Gajevic Sayegh’s and Louise Fitzgerald’s papers. Some in the room felt that market-based mechanisms employ the sorts of reasoning which lend themselves to negative externalities and self-interested behaviour, and that, independently of any effectiveness they might have, we have good reasons to be wary of them. Others, however, felt that their ethical standing is determined not by their nature, but by the usages towards which they are put. Market-based mechanisms may be policy solutions, but it is too often the case that their distributional impacts are left unexamined in cost-benefit analyses employed by policy-makers with a strict economistic focus. It’s not clear, however, that these distributional consequences cannot be accounted for, and market-based mechanisms might be profitably seen as one useful ‘tool’ in the policy ‘toolkit’. The important question here, it seems to me, is whether it is possible to sharpen what is all too often a blunt instrument. Over the course of several days, the conference provided fertile ground for the discussion of a number of important issues, many of which remained underexplored in climate politics debates. The breadth of experience in the room lent itself to insightful discussions which were able at once to pick up on important and subtle points in close detail, and to locate these finer points within the context of a bigger picture of the different aspects of climate politics. From the 24th-18th April, Vienna once again became the temporary home for 14,496 scientists from all over the world, as they gathered for the European Geosciences Union General Assembly, 2017. The week packed in 4,849 oral presentations, 11,312 posters (never before have poster tubes been such a demanded fashion accessory – save maybe for the fabric posters that became fashion themselves), 1,238 PICO presentations (think speed-dating-style consumption of new research), 88 short-courses, 322 organised side sessions, and what one can only guestimate to have been around a gazillion cups of coffee. For a cappuccino-drinking graph-lover, it was heaven. 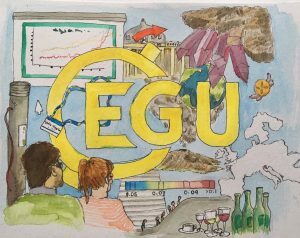 The EGU’s Annual Conference showcases cutting-edge research from Earth, planetary and space science, and is the perfect opportunity to meet the people who write the papers you cite. The range of disciplines present is proof of how much we already know about our planet and the laws that govern it; the number of conversations being had across disciplines is evidence that that we still have so much to learn. I was at the EGU to update my scientific knowledge around climate change (by trying to grasp as much as I could of what was flying over my head), and to listen to scientists’ concerns and strategies for engaging with policy-makers and the general public. 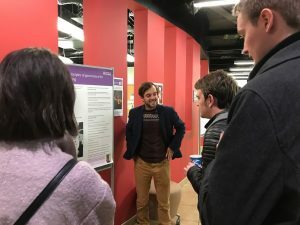 The ‘March for Science’ had happened the weekend before the conference, with many of the conference attendees participating, so my research area of policy advocacy was something that appeared in several sessions across the week. People still trust science to provide reliable results that we can base decisions on (although may sometimes feel like some people don’t). It is important, therefore, for scientists to maintain transparency. Being seen to advocate a specific policy can generate distrust. Both Sarah Connors from the IPCC and Luca Montanarella from the EU Joint Research Council emphasised the importance of being trusted to provide all policy options, not just what policy a scientist thinks is best as policy-makers have other concerns to factor into their decision making. However, some politicians may be selective in the science that they use, requiring scientists to speak up when their science is being misused (although quite how the scientific community embark upon this is controversial). Therefore, one of the key factors of being trusted is being honest about what you do not know and to be transparent about the scientific process and how conclusions are made. Heike Langenberg, editor of Nature Geoscience, said that whilst peer review can create trust and seek to make things transparent, it is mostly something that exists between other scientists – the ‘transparency’ achieved here does not translate into something that the public can readily identify as being transparent. We therefore need to be vigilant about over-reach, and how the media portray science to the public. Nutshell: Be transparent about what it you are doing and why, and speak up when science is being misused in order to maintain trust. Part of effective communication must be understanding your audience, and what it is they need. Having a relationship and engaging in dialogue with others is therefore essential for gaining this understanding. This dialogue is not just ‘educating’ the public, but being willing to be educated yourself about what concerns people have and the language that they use to describe the observations they have. Iain Stewart even suggested that we might want to consider using the public’s language around risk, rather than imposing our scientifically constructed risk-language in order to facilitate better communication and understanding. Ultimately, you can’t beat narratives with facts, scientists need to create narratives too, and that can only come from engaging in a dialogue with the audience. Nutshell: Co-creating narratives with audiences can help engage them and facilitate mutual understanding. It’s as simple as that really. Check what policy-makers are looking into by signing up to receive consultation alerts (such as here for the UK Government). If you think your research (or that of a colleague) is relevant to an issue being discussed, you can submit it to the respective committee. There are lots of opportunities to engage (which will increase through building relationships with others who are involved in policy-making), including writing to your local MP or working with business and NGOs (see below). Aside from policy, also get out there and engage with the public. Be it in schools, churches, mosques, temples, museums, libraries – there is lots going on and people love talking to a ‘real’ scientist. However, this all takes time and energy and money. Funders seem to be increasingly interested in measuring ‘impact’ and are willing to support some aspect of this, but it can be hard to justify the cost of engaging in outreach activities. This was something that many scientists felt frustrated about as outreach was something that they could see the importance of doing, but lacked the resource to do properly. Most scientists that expressed this said that they did a lot of their outreach work in their own time, and based on what funds they could scrape out of projects. Nutshell: There are lots of opportunities for scientists to feed into policy-making and to engage with the public, but scientists need better support in freeing them up to do so. So much of research is applicable to policy, but getting the research noticed by policy makers can be difficult. The ways in which research is presented to policy makers can really make a difference. The policy makers on the various panels suggested that presentation and timing were key. Graphs, maps, or any other form of diagram should not try to show more than three things – three colours are more than enough, and preferably red, yellow and green. The boundaries for these colour schemes have usually already been agreed by different regulatory bodies, so find them out. Getting the timing right about when and how research is presented can also influence how useful it is for policy-makers. Knowing how to frame the important aspects of your research for policy-makers, and when that information will be particularly useful for them requires researchers to be in conversation with policy-makers. Nutshell: Keep it simple, and know when would be best to show how your research can contribute. Policy advice doesn’t just involve government. Of course, researchers need to be aware of how they should associate with certain businesses and NGOs, but often these organisations can be in a good position to help inform and test run policies and procedures. Businesses and NGOs can also act as a bridge between the research community and government as they can help translate the research into scenarios that are directly applicable to policy. There are also lots of areas that government does not cover, so when it comes to innovation and striving to create new methods, businesses and NGO’s are often keen to crack on. Nutshell: Government policy is just one area where change can occur, businesses and NGO’s are often more willing and able to work at the cutting edge of innovative ideas. Science is an art, so to use art forms to communicate your science makes perfect sense. If science is a creative process too, then scientists are creatives. Sam Illingworth’s poetry workshop was a brilliant example of how we can talk about science with a different language, and translate our scientific creativity into another art form. No longer restricted to a technocratic methodological lab report, research findings gained rhythm and rhyme, and created a space for researchers to express the frustrations and joys experienced in their work. Whilst geologists are unlikely to be the next Shelley or Shakespeare (not much rhymes with potassium feldspar…) collaborations between researchers and artists are providing some truly beautiful public outreach projects and create potential new methods of data analysis. (rhyming)Nutshell: There’s nothing more boring than a standard graph, whereas sniffing a meteorite is quite a laugh. 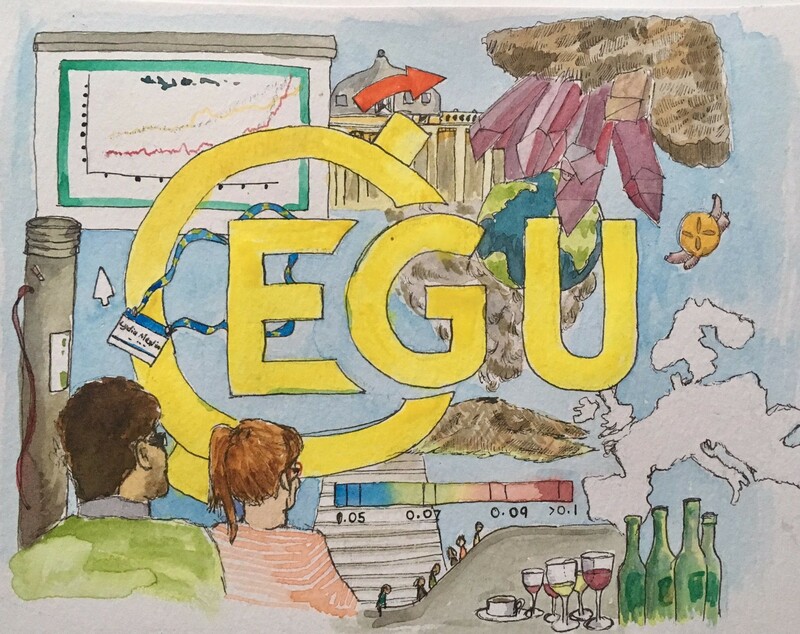 To embrace different forms of communication, I tweeted a watercolour-summary of the week at the EGU including quartz crystals, poster tubes, sausages and the never ending series of escalators. For more information on the EGU, go here, or you can watch a few of the key sessions on their youtube channel here. 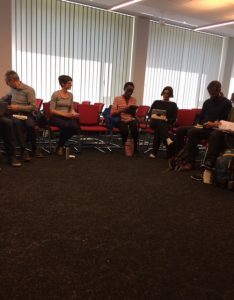 The Leverhulme climate justice scholars were fortunate enough to be invited in their entirety to a one day workshop in Bonn, entitled “Clear Eyed Equity: Setting a Climate Equity and Justice Research Agenda”. Hosted by the Germany Development Institute, the conference sought to connect academics and practitioners with an interest in the justice dimensions of climate change, hoping to deliver a manifesto that reflects the future aims and pertinence of the movement. The day began with three hard-hitting key note lectures, starting with friend of the project Sonja Klinsky (Arizona State), who stressed in no uncertain terms just how central equity is to any genuine progress. Through this, she rejected claims that we should act first and worry about equity afterwards, questioning the feasibility of any climate action that failed to pay suitable attention to this complex dimension of the climate problem. Another key theme from her talk were the importance of creating a vibrant, supportive and, importantly, interdisciplinary network of climate ethicists (partly facilitated by an email list that she has set up – details of which will be at the end of the blog). Timmons Roberts’ discussion drew upon a temporal analysis of high-profile climate discussions, to map whether the arc of history was heading towards climate justice – with the unfortunate (but maybe unsurprising) answer being ‘no’. Finally, Tom Athanasiou (Eco-Equity) delivered a sobering analysis of the extant state of play with regards to climate change, essentially concluding that we are nearly 30 years past the point of urgent action and are now staring real catastrophe in the face. With regards to arresting this rapid decline into the abyss, he highlighted the importance of addressing the startling fact that we are living in a grossly unequal world (a recent Oxfam report suggests that just 8 people own the same wealth as the 3.6 billion people who constitute the world’s poorest people). While this exists, Tom suggests, an adequate response to climate change will never be mobilised. Much of the next portion of the day involved the synthesis and discussion of the various policy briefs submitted by equity scholars globally. These were sorted into five ‘bundles’, which explored paradigmatic questions of equity, equity under the UNFCCC, justice at the local level with a focus on adaptation, equity in transformational change and social and cultural responses to climate change (the final four running in pairs, concurrently). A plethora of different ideas and themes arose here, demonstrating just how broad and multidimensional the questions of equity that arise in the context of climate change can be. 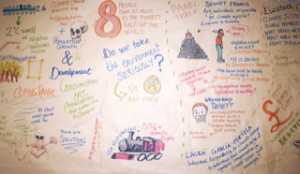 To mention but a few, there were discussions of technological and energy justice and their crossover with climate justice, how justice may look at a local level, intra-community injustices and the importance of social sustainability – including the need to develop an understanding of the creation and dissemination of environmental knowledge across scales. The workshop ended with a summary of the day’s proceedings, along with a brainstorming session on practical action that could be taken by the group as a collective. The early contours of a manifesto were deliberated, as well as identifying the need to create a platform in which scholars could discuss their particular research interests. The group then mapped a list of actors with whom they should interact, although the all-important questions of how these interactions should take place were unfortunately limited by time, to no doubt be continued on a later occasion. What was undoubtedly an excellent, and productive day was rounded of by a suitably eloquent toast by Timmons Roberts and Tom Athanasiou to their friend and prominent climate ethicist Paul Baer, who sadly passed away last year. Having reflected upon the conference, it is abundantly clear that there is an ever-growing and incredibly committed, intelligent and passionate community whose aim is to make tangible and lasting progress in the daunting task of achieving climate justice. To this end, it would be near impossible not to come away feeling buoyed by the day’s proceedings. However, the real success of the workshop lies in what happens next – the actioning of the innovative ideas, the increased interdisciplinary communication and development of a thriving and organised network of researchers and activists alike and the development and dissemination of a bold manifesto are the true indicators of how much the workshop has accomplished. The climate justice and equity emailing list can be subscribed to by contacting clim_eq@asu.edu, and also found on twitter @CJENetwork.